Our home, named LINEKIN BREEZE, is located on Linekin Bay. We have 4 bedrooms, 2 full bathrooms accommodating up to 7 guests. It`s spacious with beautiful water views and neatly appointed furnishings. Our home sits in a perfect location that is a mile drive to the magnificent homes and waterfront rock formations on Ocean Point. In the other direction you are 4 and 1/2 miles from the town of Boothbay Harbor. Thereir is quite a bit of activity there As you`ll see our home is 2 stories tall and what we love most about it is the inside and outside decks. We believe you`ll love the decor...it`s uncluttered and pleasing to the eye. The living room is cozy, comfortable and warm with plenty of seating. As you can see you can watch TV here or just lay back on one of the leather easy chairs. Put your feet up and relax. Here`s another view of the living room. There is quite a bit of natural light. ... and finally a 3rd view to give you the full dynamic of the living room. I love sitting on the window sill with a book and beverage. Yes this is my happy place. We wanted to make the kitchen special and recently installed a new galley style cooking area with new appliances and all the modern conveniences. You`ll need only groceries as we`ve fully equipped the kitchen with everything you, your family and your friends will need to cook a feast. Many lobster dinners have been prepared here Sunsets over the bay will be one of the incredible highlights of your stay. They can be seen from the back opened air decks. ... and whether you wish to lay back in a lounge chair or nosh at the table...the water side deck is a popular place to gather, chat and eat. Here`s another view of the first floor deck. We often will dine on the deck and watch the sun drop below the horizon. The first floor bedroom provides a firm comfortable queen bed. You can see the nautical decor. With 2 beside tables everyone has light and electric outlets to charge their gadgets. This first floor bedroom has two single beds and is perfect for the kids. You can see that there`s ample room and the view of the bay from these windows is exceptional. We often leave the windows open at night to enjoy Maine`s cool breezes off the bay. Another view of this room shows a whimsical nautical touch. All rooms have ample dresser and closet space for your belongings. This is my own little touch and has been my mantra for years.... Let`s continue the tour as we climb to the second floor. Our first stop is the door leading to the 2nd outdoor deck which also overlooks Linekin Bay. This deck is right off the master bedroom. The second floor Master Bedroom with direct access to the balcony. The coffee maker and mini fridge let`s you begin your day on the balcony enjoying the views or a nite-cap and snack as you watch the sunset. ...yet another view of this bedroom with a door that leads onto the open air deck. Prepare your coffee and step out and enjoy the cool air of the morning. ...and finally our fourth bedroom has one single bed. I refer to this room as a Nautical Nook ...it`s my retreat when the weather is overcast and I can`t sit out on one of the decks. Still I open the windows and enjoy sounds and smell of the bay. With 2 bathrooms, this one a full bath, you can shower or draw a hot bath. The second bathroom is spacious and nicely appointed shower bath. ...and another view of the second bathroom. We provide a full side by side by side clothes washer and dryer on the first floor. Take a stroll down the path that leads to a shared Dock and Float on Linekin Bay. From kayaking to sunfish sailing or canoeing... It`s a quick drive to East Boothbay General Store with a delicious assortment of food and beverages. Here`s a bay view of the house and neighboring bungalows. Our home is in the center and atop the photo. Sit down by the bay or picnic down by the water. If you`re with the kids they will enjoy the swing set that can be seen on the lawn to the left. 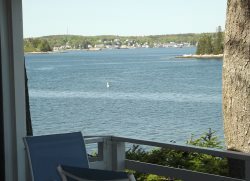 A cozy summer cottage overlooking Linekin Bay is ready for you to settle in for a memorable Maine Vacation. This four bedroom, two bathroom home is quaint, modern and thoughtfully furnished throughout. Its location offers fantastic water views and cool ocean breezes all season long. Guests even have access to the condo association's shared dock & float! Whether you love outdoor adventures or simply relaxing on the porch with friends and family, you can do it all here at Linekin Breeze. Enjoy your morning coffee on the porch while watching local Lobstermen pull in their traps and end your days with stunning sunsets. Imagine yourself kayaking around Linekin Bay, exploring the nooks and crannies that abound with birds and sea life. Take a picnic out to Ocean Point and enjoy wide open ocean views of the Atlantic with islands and lighthouses. If you enjoy hiking, we recommend exploring Linekin Preserve and the Burley Loop - two of our Region's many Land Trust Trails, both within walking distance of the cottage. THE HOUSE: Recently redecorated in thoughtful nautical decor, this spacious cottage is equipped to ensure visitors have an enjoyable and functional home-base for their vacation. From comfy furniture to free WiFi and quality kitchenware, this cottage will feel like home. First Floor: Enter from the covered porch into the sunny living room with its cozy couch, leather armchairs & ottomans, large flat screen TV and DVD player. The first bedroom is located to the left of the entryway, with two (2) twin beds. Pass through the living room into the reading nook and dining room with seating for six. Large windows offer water views from the living room and dining room. The galley-style kitchen has all new stainless steel appliances and lots of counter space for mealtime prep. Off the dining/kitchen area is the laundry room with a washer and dryer. A Master Bedroom on the first floor with a Queen bed has an attached shared bath and door out to the open deck. On the deck, guests can dine alfresco or soak up some rays in the chaise lounges. No need for AC's at this house; the ocean breezes are truly nature's air conditioning. Second Floor: Up the hand-painted staircase (please be aware steps are steep) from the entryway are two additional bedrooms and one bathroom with a shower. The 2nd Floor Master Bedroom with King bed boasts a sitting area, mini-fridge and small balcony with outdoor seating. The fourth bedroom with one twin bed completes the second floor. BEDROOMS: (2) Twins- can be converted into a King, (1) Queen, (1) King, (1) Twin. BATHROOMS: (1) Full Bath with shower/tub combo, sink & toilet, (1) 3/4 bathroom with shower, sink & toilet. THIS PROPERTY RENTS SATURDAY-SATURDAY, JUNE - SEPTEMBER. Arrival & Departure Days in Non-Peak Seasons may be flexible. Rich in boat building history, East Boothbay in renowned the world over for its shipyards. East Boothbay makes a wonderful home-base for vacationers to the Boothbay area, stretching from Boothbay Harbor out to Ocean Point. With many seasonal cottages and homes, there are a few brave souls who call East Boothbay home year-round. Visitors are encouraged to explore this beautiful part of the peninsula with walking trails that are part of the Boothbay Region Land Trust with its 30+ miles of protected, pet-friendly trails. Have a local guide take you on kayak adventures to see coastal Maine from an entirely different angle. Restaurants in East Boothbay include Lobsterman’s Wharf, The Carriage House, Ocean Point Inn, and The East Boothbay General Store. A full-service Marina is located behind the Post Office. Head into Boothbay Harbor for boating excursions, whale and puffin watches, sunset and reggae cruises and sailing trips. Be sure to visit the Maine State Aquarium and the Coastal Maine Botanical Gardens while you're here. Grimes Cove is the perfect spot for saltwater swimming and Knickerbocker Lake for a freshwater dip! Rent bikes or mopeds and ride along the coast from East Boothbay out to Southport Island or around Barter’s Island. Linen - Yes, linens and towels are provided for your stay at no additional cost. Everyone was helpful, prompt and courteous. A pleasure. We loved how comfortable the property was, so clean with a great kitchen. The location was good, with a view of Linekin Bay where we also could fish off the dock. It had more space than we needed but we enjoyed how roomy and light and fresh everything was.